In Stand-alone mode, the serial communication feature is disabled and system operates as a stand-alone Annunciator. No unique address needed for cards in this mode. All settings will be done by DIP switches and jumpers in this mode. This mode offers the best features when communication between the Annunciator and other devices is needed. The standard AIS750 supports RS485/RS232 Modbus port, RTU-Slave protocol. Optional protocols such as DNP3 are also available. In Serial mode, each card in the system has its own unique address and system configuration should be done through ALCON software. Selection of features is on a per channel basis with no special tools or programming knowledge required. 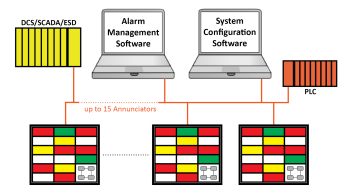 System can communicate with other Annunciators and devices such as DCS, SCADA, PLC, computer, printer and more. The AI7525 Series is an integral (display and controllers all in one package), modular, multi-point, full function, flexible and reliable Alarm Annunciator Panel and it is an ideal solution for a wide range of industries and applications, regardless of size or complexity of the alarm scheme. The modular construction allows for systems of almost any size with an installed depth of only 145mm (including display and electronics) to suit any application. 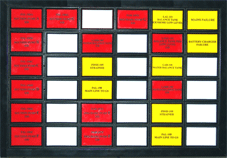 The AR7525 Series is a range of modular multi-point, full function, flexible and reliable split (separate display and electronics) Alarm Annunciator Panels designed to fulfill all the requirements of all industrial plants. In this system, display and electronic controllers are separate. The modular construction allows for systems of almost any size. Installed depth of display is only 68mm (controllers are separate). Whatever the size or complexity of your alarm scheme, the AR7525 Series can be configured to provide the best solution. Units can be constructed in any numbers of windows. Each window (75 x 50 mm) can be divided into 2 or 4 (vertically or horizontally) cells with a choice of 3 colors. The aluminum encasing allows for the best available heat dissipation ability, and at the same time affords a luxury appearance. 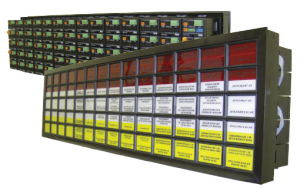 A cost effective Annunciator, designed for small applications in space restricted areas with small number of alarm points. Fully self-contained, panel mount with integral acknowledge, reset, test, and mute pushbuttons. 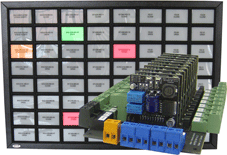 Display legends for the backlit displays can be created by the user on any standard printer. The L7525 Series Light Boxes provides maximum design flexibility and virtually maintenance free operations. It is a modular, flexible and maintenance-free Light Box (Lamp Box) that can be made in any number of rows and columns from a single window to 1000 windows with an installed depth of only 68mm to suit any application. 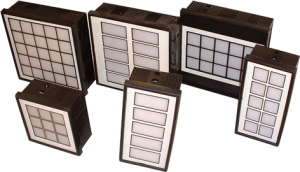 LW Series Light boxes provide a compact and maintenance-free solution to monitor the process status. It comes in 5, 9, 10, 15 and 25 window and it is a suitable solution for small applications. Display legends for the backlit windows are to be created by the user on any standard printer. We offer fully customized Light Boxes with customized specifications and dimensions as the replacement of old Annunciators and Lamp Boxes.